1. )Reflection on ONE: Text to text, text to self, or text to world connection for each bookWhile I read the story of Goldy Luck and the Three Pandas, I found myself comparing it to the book Goldilocks and the Three Bears because the two stories are so similar. The author included the traditional elements of any sort of Goldilocks story including having a young girl visit a house of bears while they are gone and trying out their different things such as their food and resting places. By the end of the book, the bears and Goldy Luck become friends just like Goldilocks and the bears do in the traditional story. I loved the twist on this book and how the author kept it true to the Chinese Culture while also making it closely follow the Goldilocks story theme. 2. )Rationale and evidence proving why each book is culturally specific This book is culturally specific because it includes many accurate details about the Chinese culture. The book includes pictures of a street decorated for a Chinese New Year and it includes culturally specific items and terms, such as the congee porridge. Finally, the book includes traditionally Chinese names for the characters (besides Goldy Luck) and some information about the Chinese New Year. 3.) Six discussion questions for each book using all six levels of Bloom’s Taxonomy a. What is congee? b. What was the main idea of Goldy Luck and the Three Pandas? c.	What would you have done if you were Goldy Luck and the door opened when you got to the apartment? d.	Compare Goldy Luck and the Three Pandas to Goldilocks and the Three Bears. e.	Justify Goldy Luck’s decision to enter the apartment and try out all of the Chan’s things. f.	What inferences can you make about the Chan’s based on their reactions to Goldy Luck? This fractured tale is a delightful way to teach children about the Chinese New Year traditions. Cultural education is presented throughout the story in a very age appropriate, interesting way and also in the back matter. The illustrations add depth to the Chinese New Year rituals and preparations, with lots of red to bring good luck.As a first grade teacher, I embrace opportunities for children to make text to text connections and comparisons. Analyzing this story in comparison to other fractured Goldilocks tales, will help students create a deeper understanding of the story elements. In contrast to the original version of the Goldilocks tale, Natasha Yim puts problem solving in Goldy's hands at the end of the story. Hooray for children as problem solvers! Natasha Yim’s picture book, Goldy Luck and the Three Pandas, is an adorable and sweet Chinese American Goldilocks and Three Bears retelling. Little Goldy is sent by her mother, on the Chinese New Year, to wish their panda neighbors happy new year and bring them a plate of yummy turnip cakes, but the neighbors aren’t home and upon entering their home Goldy drops the turnip cakes all over the floor! What follows is a familiar set of events, but with a wonderful new cultural twist.I love this picture book! Natasha Yim has created an unforgettable fairytale retelling that, while reminiscent of the original, is very much its own wonderful and captivating story. Yim introduces the Chinese New Year to young readers in a way that will excite and amuse them, while teaching them all about this amazing holiday. Goldy is such a cute, relatable little character! She’s not angelically good or bad on purpose, she’s simply and genuinely a kid. Little readers will love exploring the panda’s home with Goldy and watching her create one disaster after another! Along with teaching readers all about the Chinese New Year, this book offers a timeless and heartfelt message about love, friendship, and forgiveness.The illustrations, by Grace Zong, are beyond gorgeous! Bright, detailed, fun, and full of such life and spirit, these illustrations are the absolute perfect companion to Yim’s story, and little readers will find new delightful things in them with each read.I also love that the author has included, at the end of the book, more easily understood information about the Chinese New Year, the Chinese Zodiac, and even a recipe for turnip cakes!Retellings of famous stories can be a tricky thing to pull off, but Natasha Yim has done it with ease! 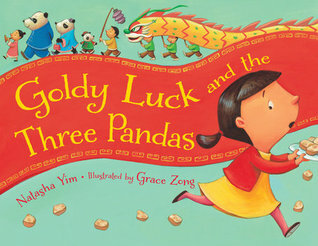 Imaginative, sweet, and fun, with fantastic illustrations, Goldy Luck and the Three Pandas is a gem of a picture book! (KidLit ED204 category: fairy tale)"Goldy Luck and the Three Pandas" is a fractured fairy tale version of Goldilocks and the Three Bears. In this version, Goldy, who ever though she was born in the Year of the Golden Dragon, a very luck year, was not lucky at all. On Chinese New Year, Goldy's mother asked Goldy to take their neighbors turnip cakes and wish them "Kung Hei Fat Choi." The neighbors are not home, and that's where the story begins to follow the traditional fairy tale, but with a Chinese twist. Once Goldy is back home, she does not feel right when she eats her congee (rice porridge) or when she sits in her rocking chair or sleeps in her own bed. She knows she must go back and apologize to the Chan's. And Goldy's luck changes, when she makes a new friend, Little Chan.The illustrations in this beautiful and are a good way to show Chinese culture. here is also notes in the back of the book that talk about the Chinese Zodiak and other details about the Chinese New Year. There is also a recipe for turnip cakes. :)This book would be great to share with young students, to compare and contrast with Goldilocks and the Three Bears. But it could also be used to introduce students to a lesson on the Chinese New Year and their traditions. Goldy Luck and the Three Pandas by Natasha Yim and illustrated by Grace Zong is a lively picture book that is a wonderful introduction to Chinese New Year traditions.The main character, Goldy Luck, isn’t enthusiastic about taking turnip cakes to the Chan family for the New Year. After all, things hadn’t been going that well for her the previous year and she just woke up. Things get even worse when she spills the turnip cakes on the Chan’s floor, is so hungry she eats their food without permission, and accidentally breaks their furniture. Will her bad luck ever end?Author Natasha Yim has built her story on the familiar and comfortable tale of “Goldilocks and the Three Bears,” but has made it fresh by adding details of Chinese New Year traditions and a new ending that gently teaches children about responsibility and conflict resolution. I was not surprised to learn that Yim has training in counseling as well as English, because her expertise shows.Goldy Luck and the Three Pandas is delightful. After reading it, I was excited to come up with some ideas for activities to extend the book. I hope reading it encourages others to learn more about the Chinese New Year and Chinese traditions, too.For a complete review and added activities, see Wrapped in Foil. Text to Self Connection: Though this story is a fictional story, I couldn’t help but relate to the main character Goldy. In this story, Goldy is portrayed as very clumsy and I am one of the clumsiest people I know (i.e. I fall down steps). I also related to Goldy when she went to sit in papa bear’s chair because it has the roller massage built into in and it hurts Goldy. I, too, think that those built in massagers hurt, especially the ones at nail salons! In a way, Goldy seemed a little bit picky, just like me!Evidence of being culturally specific: Though this book is a remake of Goldilocks and the Three Bears, the author Natasha Yim made it culturally specific to the Chinese culture because it is centered around the Chinese New Year. The traditional food, changi; the native animal, the panda; the Chinese zodiacs; and the tradition of the Chinese New Years all make this a culturally specific text. Blooms Questions:Remember: Name the two things that Goldy was supposed to have?Understand: Summarize the story.Apply: What examples can you find to support Goldy’s bad luck?Analyze: How would you compare yourself to Goldy?Evaluate: What choice would you have made if you had dropped all the turnip cakes?Create: Create a new story ending. Text-to-Self Connection: The setting of Chinese New Year reminds me a time I was visiting Chinatown in Chicago, Illinois. Some friends and I enjoyed good food and watched a very colorful and interesting parade. It was quite the celebration!Rationale: This book is culturally specific to Chinese culture. It seems the setting is either in China or in Chinatown somewhere. The language and references used are specific to Chinese culture and tradition.Blooms Taxonomy Questions/Prompts:1. Remembering: What are the reasons Goldy’s family believe she will bring good luck?2. Understanding: Describe what happened before Goldy took the turnip cakes to her neighbors.3. Applying: What would result if her neighbors, The Chans, had answered the door?4. Analyzing: How would you compare this story to the traditional story, Goldilocks and the Three Bears?5. Evaluating: What choice would you have made if you were in Goldy’s situation? Would you go back the Chan’s apartment to help? 6. Creating: Invent a new scenario that involves aspects from your culture. 1. A text to text connection I made is to the story Goldilocks and the Three Bears. They both had similar plots, but this book put a spin on the characters and objects found in the story. It is also a great book to discuss the Chinese New Year with as well. 2. This book is culturally specific because it ties in details and illustrations that relate to the Asian American culture. There are specific types of food, sayings, and holidays referred to in the story that are true to the Asian American culture. The artwork is also another way the culture is expressed through the story. 3. •	Remembering: What is Goldilucks problem in the beginning of the story?•	Understanding: Describe what happened before Goldiluck eats all the congee?•	Applying: How is Goldilucks similar to Goldilocks?•	Analyzing: What was the most exciting part of the story?•	Evaluation: Do you agree with what Goldilucks did in the Chan’s apartment? Why or why not?•	Creating: Role play the story. In this version of Goldilocks a sleepy Goldy Luck is asked to take turnip cakes to neighbors on New Year's Day. When the cake falls on the floor the traditional progress of events begins with congee, chairs and beds. When Goldy is woken up by all the noise she apologizes saying she didn't to fall asleep and runs home. This is where the story diverts from the traditional version. In this version the story continues with Goldy starting breakfast, but thinking about Chan (baby panda) not having any, reading in her rocker and remembering Chan doesn't have one anymore and finally thinking about the mess she left in the bedroom. She takes her breakfast to Chan and offers to help straighten and fix the chaos she left behind. The two make more turnip cakes together. A turnip cake recipe is included along with an author's note about Chinese New Year. A retelling of Goldilocks that happens on Chinese New Year. When Goldy goes next door to deliver turnip cakes to the Chans, they are not home. The first thing Goldy encounters is congee in three bowls, then three chairs (one a vibrating one) and then three beds. The story proceeds as the folk tale until the end. When Goldy starts to feel bad about breaking Little Chan's chair and eating all his congee, so she returns to help fix things.Includes information at the back regarding Chinese New Year, the Chinese zodiac and a recipe for turnip cakes. A solid addition to the library collection for diversity, Chinese New Year and fractured folk tales. This is such a cute and funny book. As you can imagine it's based on the Goldilocks and the Three Bears story but the main girl in this book is a Chinese girl celebrating Chinese New Year, and the three bears are, naturally, pandas. I like that after making a mess at the panda family's house, Goldy regretted that she ran off and actually went back to their house to apologize and make amends. It's a feel good story for a new year and you can have a glimpse at how other culture celebrates New Year too. I'd think it's a little lengthy for really small children but for this one Little Guy didn't mind it at all. This retelling of Goldilocks and the Three Bears is set during Chinese New Year and contains many symbols from Chinese culture.The rewrite works well and the extended ending whereby Goldilocks struggles with guilt before setting things right makes for a good conclusion. An author's note follows the story explaining rituals present in the story as well as the Chinese zodiac. A recipe for turnip cake is also included.Highly recommended as a read aloud during a fairytale unit and especially during Chinese or Lunar New Year units for grades grades 1-4+. An adorable, clever and culturally enlightening (for those not familiar with the culture) re-envisioning of the Goldilocks tale with very cute illustrations! I just have a personal aversion to the expression "gung hei fat choi" because growing up, it was said almost facetiously by my parents' friends. I much prefer the "sun neen fai lok" phrase which is the plain but more sincere-sounding "happy New Year." Goldy Luck and the Three Pandas by Natasha Yim, illustrated by Grace Zong – This is a very cute story about a little girl who believes in having good luck and hope for a new year. The book introduces the Chinese New Year traditions a little bit throughout. Also, it has a lovely spin-off of Goldilocks and the Three Bears. This is a special book. Me and my children all LOVED this book. Not only is it well told, fun, whimsical, and well illustrated, but it teaches along the way without being preachy. Children (and adults) learn about Chinese New Year, it's traditions and the book even includes a recipe in the back for a food item mentioned in the text. A huge and emphatic 5 stars! This is a twist on the Goldilocks story with elements of Chinese New Year incorporated. Instead of porridge, there is congee. Other elements of Chinese culture are present. A nice twist at the end is when Goldy Luck runs out of the house, but then feels remorse and goes back to make new turnip cakes, make the beds and fix the chair. Chinese New Year retelling of Goldilocks and the Three Bears features poor Goldy Luck, who is worried about being unlucky for another year. Her fear of bad luck (and her extreme tiredness) lead her into some predictable situations ... but with a twist for the ending! This book adds a cultural twist to Goldielocks and the Three Bears. It has very colorful illustrations and emphasizes fixing mistakes. This would be great to read with preschoolers and early elementary students. This would make a great comparison book to the original story. This is a great book about friendship and and doing the right thing even when it is hard to admit mistakes. There is some mention of the Chinese New Year mixed with the Goldilocks story. Great illustrations and a lovely message. What a very playful and thoughtful rendering of Goldilocks and the Three Bears. I really liked it. From the storyline to the illustrations, this book was a colorful, creative work. The author's note was helpful and helped me better understand the cultural significance of what was in the book. A solid addition to the school library--with obvious fairy tale and Lunar New Year connections. Good back matter: author's note, Chinese Zodiac and lucky character information and a recipe for turnip cakes. A retelling of a classic story set in contemporary Chinatown. Quite enjoyable! I especially love Goldy's actions after her visit to the Panda's home. Such a cute adaptation of the original fairy tale, and I loved how they took it further. Great message and fun story! I teach two weeks of Chinese New Year lessons every year. I like to use newer books. This book is perfect.